Sturdy, robust and built to Last! 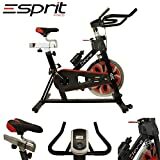 The Esprit ELEV-8 Spin Bike is available in a stylish black and red finish. This exercise fitness bike is suitable for home use and once set up can be used whenever you feel the need to exercise. The ELEV-8 Spin Bike will give your legs a workout and really improve your general cardivascular fitness. The bike is ideal for people who live in a big city and can’t safely cycle on the roads and also for people who can’t afford the ever increasing gym membership prices. When you have your own exercise bike you can workout at a pace that suits you and with its design you’ll be burning off calories and improving your fitness in no time at all. The bike features a 15kg flywheel and also an emergency stop system meaning you can exercise in confidence, while the handlebars and seat are both adjustable so you can adjust them to suit your needs and provide you with a realistic and comfortable cycling experience. When you have your own exercise bike you can workout at a pace that suits you and with its design you’ll be burning off calories and improving your fitness in no time at all. The bike features a 13kg flywheel and also an emergency stop system meaning you can exercise in confidence, while the handlebars and seat are both adjustable so you can adjust them to suit your needs and provide you with a realistic and comfortable cycling experience.